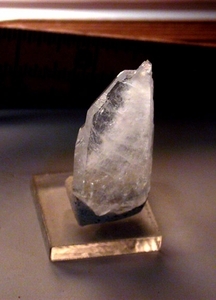 This doubly-terminated Arkansas tabular faden quartz crystal would make a particularly nice set or wirewrapped pendant. One end is multi-multi-terminated after contact and has a rounded shape, the other is step-faced with the offset point accentuating the rare veils. 3-16x 13/16x 1-7/8" long. Pastel rainbow barnacles, record keepers and sparkle.